Keep up with the latest warehousing and logistics news from Colby Storage Solutions and Dematic. Warehouse storage system upgrades, can be a costly exercise. In a highly competitive landscape, Australian and New Zealand businesses cannot afford to make the wrong decision about their new racking system and risk a lengthy roll-out, expensive modifications, or worse, a collapse. Making the wrong decision about your storage solution will inevitably lead to missing out on the desired speedy return on investment (ROI) and risk the safety of your staff. It doesn’t make sense to invest in a one-size-fits-all racking system imported from overseas that may not offer your business adequate product strength and durability, or safety. It is vital that every detail is taken into consideration when designing the right storage system – for example warehouse space, load sizes, work functions, MH equipment, and product type. All these factors come together to help guide the design of a purpose-built racking system. A Colby Storage Solutions professional can help design a solution that achieves the strongest and safest racking system. Locally built, ColbyRack is manufactured in Sydney by Dematic and is made from Australian high-tensile steel which exceeds Australian and international standards. The product quality has remained consistent for over 50 years and is supported by a lifetime warranty. High-strength steel and smart section design combine to provide maximum upright strength at minimum cost, in even the toughest conditions. Colby’s confidence in the products and materials it uses means peace of mind because you are getting the highest quality, most durable and safest storage solution on the market. Colby is so committed to product excellence that they didn’t wait for the development of Australian standards, instead designing and building ColbyRACK to meet rigorous international standards. Colby’s RackMan software guarantees the load-carrying capacity and strength of ColbyRack, protecting your staff and products. Forklift incidents happen in high and heavy pallet storage. ColbyRACK minimises forklift damage to storage systems in high volume distribution centres. The patented, heavy-duty ColbyRACK UU-Beam delivers 3 mm RHS performance at half the price. Its innovative design increases frontal impact resistance by over 200 per cent, which virtually eliminates damage, significantly reduces rack maintenance costs, and improves safety of operators. In the case of front uprights, damage is normally easy to identify, however, damage to rear uprights may be difficult to pick up, especially when the location contains a pallet of stock. Colby rear upright protectors eliminate the potential for damage when putting away pallets in ground level storage locations, optimising storage system safety and reducing ongoing rack maintenance costs. And you don’t need to be using ColbyRACK to take advantage of Protect-a-Rack – it can be fitted to any brand of racking. 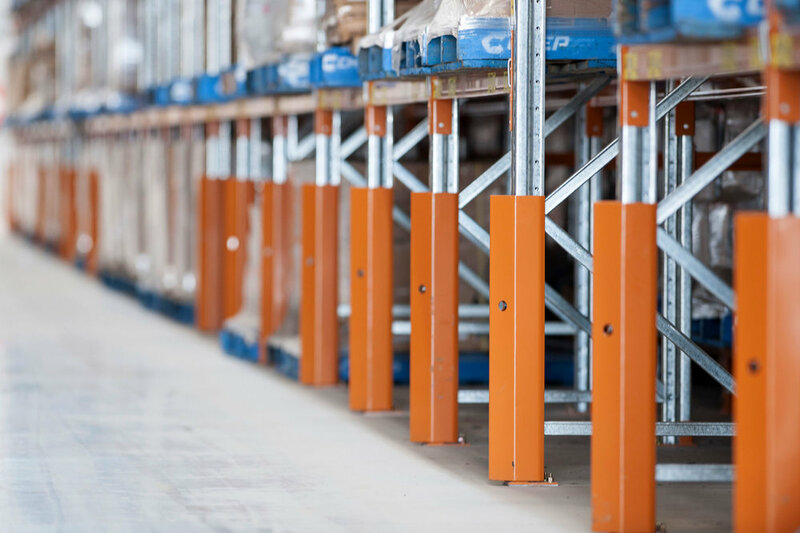 Because it’s designed to withstand forklift impacts and to protect racking from accidental wear and tear over the long-term, Colby Protect-a-Rack improves warehouse safety and reduces maintenance costs. Manufactured from heavy duty steel, fortified with full strength welds, and designed to dissipate impacts and transfer forces through the floor, Colby Protect-a-Rack outperforms traditional steel and plastic rack protection systems. Beam connectors are critical to the performance and stability of your storage system. Made from structural steel, Colby’s custom-designed 4-tang beam connectors meet the same rigorous safety standards as its high-performance beams and uprights. ColbyRACK’s unique diamond slot profile provides a stronger and more efficient interlock between uprights and beams, significantly reducing the potential for accidental dislodgement of beams by forklifts when retrieving or putting away pallets. When making a large business investment such as a new racking solution, it is vital that you have a true storage partner who can design a solution to meet your needs now, and as your business grows. Colby Storage Solutions’ nationwide distributor network ensures that you and your new storage solution is supported by a seamless, one source, implementation capability that reduces time, cost, and risk. This high level of support delivers not only the best racking designed especially for your unique business needs, but also means a faster roll-out and a path to the desired ROI. Thank you for our enquiry! Selective, or high-density? Which racking solution is right for your business? Call For A Free Measure And Quote!